TLDR; Everyone can tap into humour when they are themselves and with their friends. Can you respect your work peers enough to be yourself with them and tell hard truths using humour when necessary? I was listening to an audio book by Grant Cardone this morning and he was talking about humour in the sales process, the author of this audio book. I was thinking, I use humour in software testing. I cover humour in the book Dear Evil Tester, and there’s a section in here in the afterword section. The ‘Afterword’ is a a section that I think some people skip. That’s up to them, but they’re losing some of the most valuable material where we summarise the main points of the book. There’s a section in there where I’m saying “humour can tell hard truths in a way that people listen”. I noticed that when I was working on waterfall projects in the past, where, in meetings, software testers were the ones that were cracking jokes. Trying to make the situation, not less serious but less tense, because everyone was getting really tense, everyone was getting antagonistic, and there was no joy, or love, or respect, or humour in the room whatsoever. That still happens nowadays even in agile projects, in stand-ups or retrospectives. At the point in the project where we have to retrospect, self-analyze, and take things really serious to get down to the root cause, but not so serious that we blame everyone. Seriously enough that we can take our process forward and improve, humour can work really well in there. Again, I’ve seen testers, and sometimes the project managers, because managers often know how to use humour in a situation to help bring the team together (some people might perceive that as their only skill!). People do this in different ways. Some people crack jokes; I don’t crack jokes. I don’t remember any jokes, and the comedians I like, don’t really tell jokes. They use observational humour, humour that comes from truth that’s sometimes hard to accept. They often describe a situation and take it to an extreme in order to demonstrate its absurdities and its ambiguities. But still try to get at the core of what is important in the situation, but strips away, through humour, the things that are not important, that are absurd and that complicate and distract us from the point that we can deal with. “No”, pretty much everyone is funny with their friends. When you’re chatting with your friends in an informal situation, you will interrupt them, you will make jokes, you will have observations that people laugh at. Everyone is funny when we are ourselves, when we tap into that thing that makes us us. We have to do that for our testing because we have to make our testing unique and personal to us. I’ve been rambling a bit, so… a technique. I found a tape set a long time ago, it’s called “Humour, Risk and Change” by C.W. Metcalf. Unfortunately it’s unreasonably hard to get hold of now and can be very expensive, but you can find some videos of him on YouTube. He used humour in a medical setting. There is a book called Provocative Therapy by Frank Farrelly. He used humour in a very human therapy approach. Or study the comedians you like. Whatever comedians you like, listen to their records. I really like Bill Hicks, so I thoroughly recommend Bill Hicks even though his style of communication might not be the best one for the meetings that you’re in, but I really like Bill Hicks. Find a comedian you like and look at how they communicate. If you don’t want to do that, if you’re nervous about bringing professional humour or therapy into a process you’re working with, look at the people around you, the ones that do use humour to diffuse situations or to communicate messages that are hard. Look at how they do it. Try to deconstruct it, then own it. First of all, copy it. Deconstruct it to model it. Use it and own that model. use the feedback that comes back, and amend your model. The easiest way to do this, remember, is to respect the people you’re with, treat them as though they’re you’re friends – and that doesn’t mean you’re nice to them, that means you’re honest with them because they’re actual humans and peers and you respect them. You respect them enough to bring yourself to the table, and the meeting, and open yourself up for the humour inside you, and the risk that that involves when no one laughs, no one enjoys what you said. But you said it honestly, there was a truth that was spoken and you tried to make it light because you’re trying to strip away the biases and tenseness that sits there. This is one of the things that I cover or stress in Dear Evil Tester. 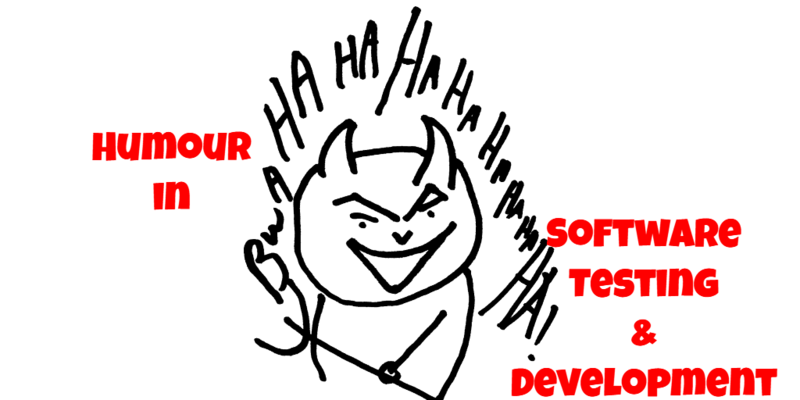 “Dear Evil Tester” isn’t just for testers, this isn’t just for people who want to improve their testing. This is about how to take your testing or your discipline seriously enough that you will find humour in it. That’s what I hope you do because that’s essential in meetings and making things work. – P.S. Dear Evil Tester makes the perfect Christmas present. I’ve just bought 50 copies myself and I’m sure I’ll be giving some as Christmas presents this year.